Featuring 100 cards. Shop for base sets on eBay. 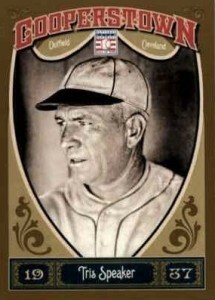 2013 Panini Cooperstown Baseball is another tribute to the Hall of Fame. Featuring only all-time greats, the product is highlighted by the inclusion of one on-card Hall of Fame autograph in every box. 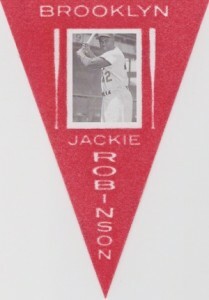 Insert offerings have also been expanded to include tributes to some early hobby products. 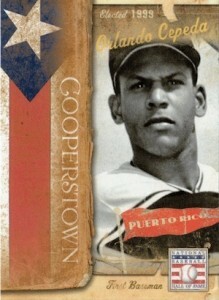 2013 Panini Cooperstown Baseball base cards come with a new design. Player photos are placed inside a shield-shaped frame. A bold Cooperstown headline and several accents are also included. 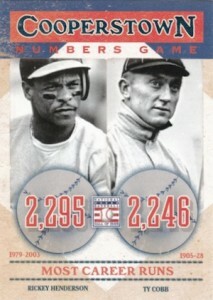 The 2013 Panini Cooperstown base set has 100 cards. Colorized base set short prints return, falling two per box. There are ten total, making a complete set 110 cards. Every hobby box also has 12 Cracked Ice parallels, half of which are numbered. This is much higher than the three parallels that came in 2012 Panini Cooperstown boxes. Cracked Ice cards have several different levels: Green (6 per box), Blue (#/499, three per box), Red (#/399, two per box), Gold (#/299, one per box) and Black (1/1). Also returning are Cooperstown Signatures. All are hard-signed by Hall of Fame inductees. The 2012 set had one of the deepest checklists of any 2012 baseball card product. 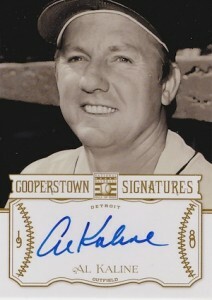 New to 2013 Panini Cooperstown Baseball are Heroes Buyback Autographs. Autographs combine to fall one per box. 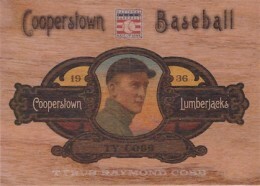 Cooperstown Lumberjack cards (1:12 packs) are printed on wood card stock. They come with several variations that have subtle differences to make building a set more challenging. 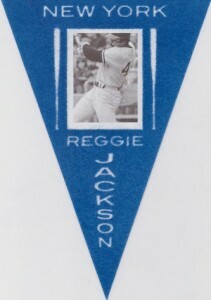 Like the brand's first set, not all cards use player images. 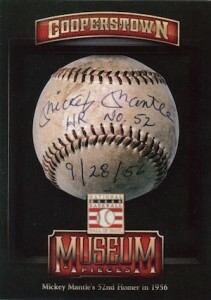 It's more about the story of baseball's rich past, a past that includes many important artifacts. 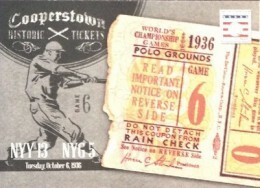 Historic Tickets (1:6 packs) spotlight important games using images of the actual game tickets. Every 2013 Panini Cooperstown Baseball pack reaches to the hobby past with a Colgan's Chips Disk. These small circular cards are based on a line of premiums that were released between 1909 and 1913. The new set has more than 160 cards. All feature Hall of Famers or Deadball Era players. Every box comes with either a 5" x 7" Lumberjacks Die Cut or a Pennant box topper. Love the Cardboard Connection especially the checklist portion. Very handy when organizing the unnumbered Colgan’s Chips subset this set contains. Unfortunately your checklist numbers do not match those found in the May 2014 Beckett Baseball. Why is that? Gary Avise � Can you give some examples? When we do our checklists, they usually come from the manufacturers so we figure they’re correct given the source. We’re happy to make any corrections. 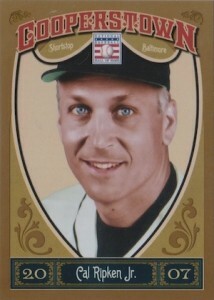 i love cards of the hall of famers and you did it very well. These were “done” by Panini. Not by Cardboard Connection. CC just relays the information regarding the set. That’s all. Being an all baseball product, the lack of baseball licensing kills a lot of interest in this product. At least with products like Golden Age, some sports are licensed and you don’t have to look at nothing but AIRBRUSHED uniforms and hats. These unlicensed products NEED TO STOP. Why the MLB isn’t fighting harder to stop these products from being made is beyond comprehension.